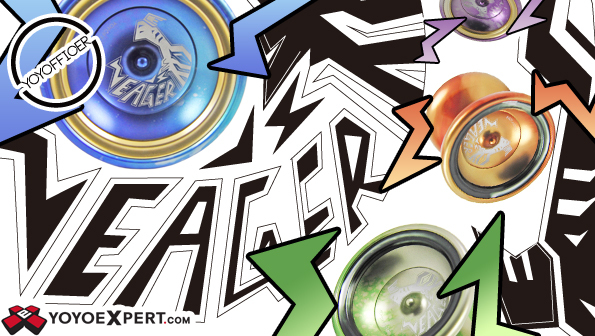 The YOYOFFICER Eager is an undeniably great, high-end, yo-yo with a really cool and unique look. It is machined with an aluminum body and added aluminum weight rings. These aluminum rings increase rim weight for added stability and give the yo-yo a really standout, beautiful, style. The wider V shape profile of the Eager creates a really nice, floaty yet fast, play style while the rounded shape of the edges keeps is super comfortable in hand. And yes, the Eager is on the heavier side but somehow it doesn't feel like it at all, you don't get that 'weighty' feel when playing with the Eager, it just floats through tricks. YOYOFFICER anodized the Eager in some amazing color combinations then fitted it with a 10 ball bearing and their signature black response pads to ensure a tight bind every throw. When you throw the Eager you can feel the potential within - It feels almost enthusiastic, like it is ready and waiting to help you nail that perfect freestyle routine!